Our people are our greatest asset. We take pride in attracting, employing, mentoring and watching our people grow in their careers. We are proud of our people and their achievements. Marc Jarret is one of those, originally taking up a role with ARA Property Services as a part-time night cleaner earlier this year. Marc then entered into our cross-divisional cleaning labour pool working on various sites under the ARA Indigenous Services banner. 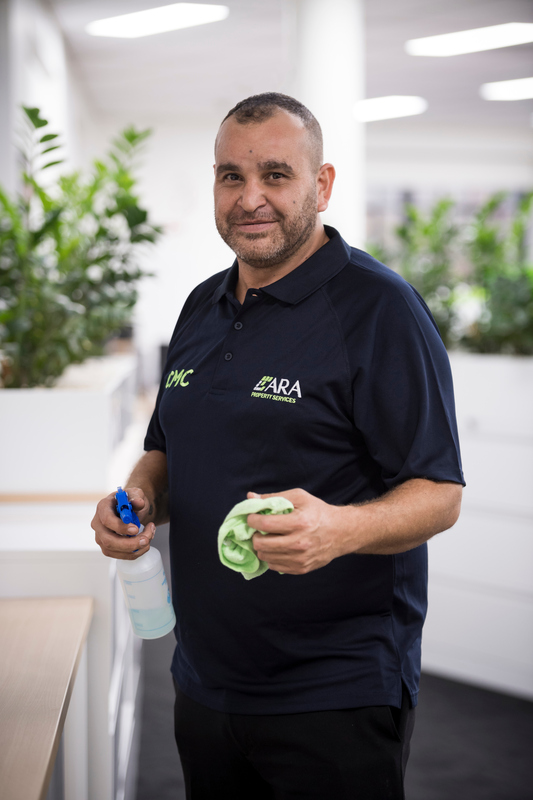 Indigenous Engagement Officer Michael Grech said that Marc has worked hard and proven himself as an asset to our ARA cleaning team. “It is great to see staff like Marc developing and growing in their roles. We work hard with our staff to support them and open doors. I am really proud to be a part of this,” Michael said. Tell us about yourself and your background. Where you are from? Who’s your Mob? I’m a 39-year-old single father of three children: my eldest and only daughter is 12, and my two sons are 7 and 3. I was born and raised in Sydney and my family are originally from the North Coast Nambucca heads region. How did you hear about the cleaning opportunities with ARA? I take my kids to the ‘Clean Slate Without Prejudice’ boxing program at the NCIE in Redfern three mornings a week. That’s where I met Michael Grech (ARA Indigenous Services’ Indigenous Engagement Officer), and we sparked up a conversation about what ARA has to offer. How long have you been in the industry? What other roles have you had? I really only had casual labouring jobs prior to this role. I had been out of work for 6 years as I was concentrating on raising my children. How long have you been with ARA? I have been employed by ARA Property Services on the Thales contract for three months now. All aspects of commercial cleaning and working a night shift in a great team of four. I enjoy the team atmosphere here at ARA. I have a sense of belonging amongst them and we all enjoy getting in and getting the job done. What do you enjoy most about working for ARA? What are some of the challenges? ARA Indigenous Services’ engagement is the strongest part of the ARA Group that makes us feel good being a part of the team. What I enjoy the most is the work-life balance that I have in my life now. Getting back into a work routine has been my only challenge. What have been some personal achievements or highlights for you during your time at ARA, and in the industry in general? The satisfaction of being able to provide for my family and to lead by example for my children. The thing I like about cleaning is that it’s a safe environment, and taking ownership of my weekly duties through open communication with my team members is going really well. What sort of mentoring and support does ARA offer? ARA offer all types off support. I have felt comfortable having a mentor there for induction and training days and it’s good to know that I will bump into Michael Grech each week for a chat. It is much-needed, and I am grateful for the support. I would like to be a supervisor and to go as far forward as I can to show my kids that anything is possible. I have now achieved this which is great. If someone was applying for a job at ARA, what advice would you give them about working at ARA? Go for it. It’s a good company to work for, the people are very easy to get along with and they provide great support both on and off the job.